In this book by George V. Higgins, the first of four featuring sleazy Boston-based lawyer Jerry Kennedy, Kennedy tells his wife that he cannot bring in P.I. "Bad-Eye" Mulvey on the case he is working, and adds, “Cooper uses a guy named Spenser and says he’s pretty good, but Spenser’s one of those fresh bastards that thinks he’s the sword of justice and goes running off to London every chance he gets, like he was trying out for his own television series.” This is clearly a reference to Robert B. Parker's P.I. Spenser, and brings Kennedy into the Crossover Universe. I've already written this one up. 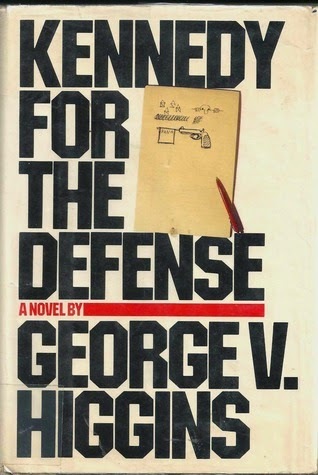 At least a few of Higgins' other novels are connected to the Kennedy books. Federal Agent Pete Riordan, a minor character in Kennedy for the Defense, reappears in The Patriot Game, which also features the title character of Higgins' earlier novel The Digger's Game and his brother. A review on Goodreads says that other characters from previous books appear, but sadly doesn't give specifics, so I'll have to research that on my own. According to Wikipedia, the books Trust, Outlaws, and Bomber's Law also take place in the same continuity as the Jerry Kennedy series, but again details are not given. One of the characters in Trust, Ed Cobb, reappears in Victories. Finally, Impostors refers to both Jerry Kennedy and "Bad-Eye" Mulvey. Therefore, I will be reading all of the aforementioned books and including them in the new volumes.